Furniture Bank Duo Earns Honor from AmeriCorps - CARITAS - Shelter. Jobs. Recovery. Hope. Huey Gordon and Lori Schmiege have been working with CARITAS for nearly 10 years. 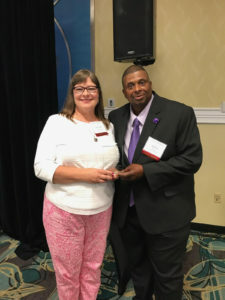 On May 21, the Furniture Bank duo received the National Service Alumni of the Year award during the Virginia Volunteerism and Service Conference. Both originally joined the CARITAS team as AmeriCorps service members. Today, Lori is the Furniture Bank Warehouse Manager and Huey is the Warehouse and Laundry Supervisor. They infuse the day-to-day operations at CARITAS with a signature “get it done” attitude and warm compassion. It all started when Lori heard about a volunteer opportunity in 2008. The Furniture Bank had just opened. She was drawn to the leadership of Chief Operating Officer Karen O’Brien and the entrepreneurial spirit of the organization. When an AmeriCorps position opened up, she knew she had to apply. As the Furniture Bank grew to serve nearly 1,000 people a year, the team also grew. CARITAS needed more drivers to receive donations and deliver them to families finding new homes. Huey joined the CARITAS team as an AmeriCorps service member in 2010. He is a graduate of the CARITAS Works program. After finding work outside of the organization, he found his was back thanks to the AmeriCorps position as a driver at the Furniture Bank. Huey criss crossed the city as a driver. Huey and Lori’s AmeriCorps service contracts eventually turned into full-time jobs for them at CARITAS. Since, Lori has helped design and launch the CARITAS heated treatment trailer that allows us to treat all incoming donations of mattresses, box springs and upholstery with heat instead of chemicals. Thanks to this innovative effort, Lori helps CARITAS save money and remain environmentally friendly. 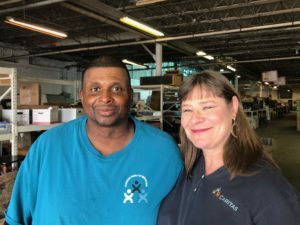 Huey helps Lori manage the drivers and warehouse employees who coordinate incoming and outgoing furniture and household items. Huey also helps manage all of the laundry services for CARITAS’s Shelter, which is a huge challenge as Shelter volunteers and staff serve more than 1,000 people each year. Together, they help connect the community to our clients. The duo does much more than manage the complex logistics of the Furniture Bank. The Furniture Bank is a transitional employment opportunity for men and women rebuilding their lives after a crisis. Huey and Lori mentor AmeriCorps service members and other employees who come through the warehouse. As new AmeriCorps service members emerge from hard times and join the CARITAS team, they can look to Lori and Huey to as mentors who understand their struggles, are invested in their recovery, and can teach them how to be excellent employees when they move on. Since joining CARITAS staff, Lori and Huey have mentored 40 AmeriCorps members–that means they’ve helped write 40 performance development plans and more than 100 reviews. Not only is CARITAS touched by their daily dedication, the community is transformed as each of these service members moves on to build a brighter future for us all.